Fluids such as water are Newtonian, and their viscous behavior is well understood. However, many common fluids are "viscoelastic." These fluids, such as those commonly found in cosmetics, soaps and paints, possess a combination of viscous, liquid-like and elastic, solid-like properties and we know surprisingly little about how they flow. Despite not knowing much about their flow properties, manufactures add these fluids to many different types of everyday products. Without viscoelastic fluids, life would feel much different. We wouldn't be able to enjoy the rich lather of shampoos, nor the chewy texture of a gummy candy, nor the springy comfort of a well-built athletic shoe. To understand more about these fluids, researchers from the Micro/Bio/Nanofluidics Unit at the Okinawa Institute of Science and Technology Graduate University (OIST) study the flow properties and behavior of different viscoelastic fluids. Prof. Amy Shen, leader of the unit, and Dr. Simon Haward, the group leader of the unit, are investigating two specific types of liquids commonly used in manufactured products: polymer solutions and 'living polymer' solutions. Polymers are long molecules comprised of repeating subunits. Polymeric solutions have a wide range of applications, particularly in the formulation of foods, inks, paints and even prosthetic fluids such as eyedrops and artificial saliva. During flow, these long polymer molecules can become stretched out like rubber bands, which give the fluid its elasticity. In a collaborative study with Massachusetts Institute of Technology researcher Professor Gareth McKinley, Shen and Haward observed the flow patterns of a series of viscoelastic polymer solutions through a 4-way junction (Figure 1). 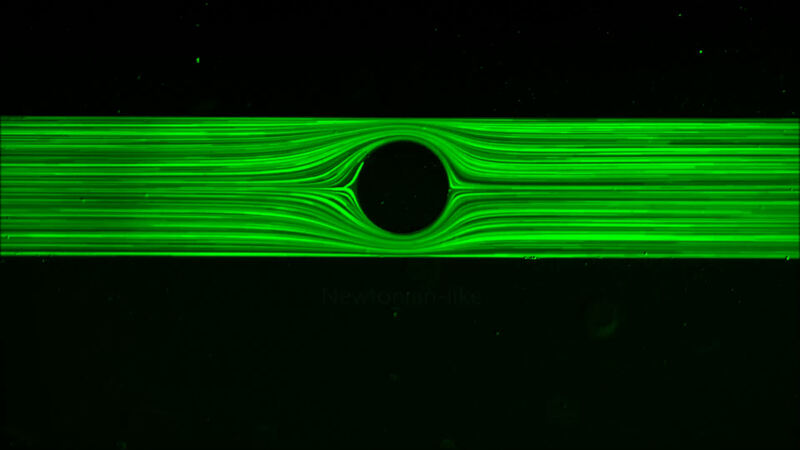 Using a technique called flow-induced birefringence, they showed that as the rate of flow through the junction was increased, polymer molecules became highly stretched out at in a narrow strand passing through the center of the junction. Flow induced birefringence is caused by small measurable changes in the refraction of light passing through a liquid when it is made to flow. These changes in light refraction directly correlate to elastic stresses in the flowing fluid. The researchers found that the strong elasticity within the birefringent strand caused severe distortions of the observed flow patterns. Increasing the flow rate further led to the onset of large fluctuations or instabilities in the flow patterns. 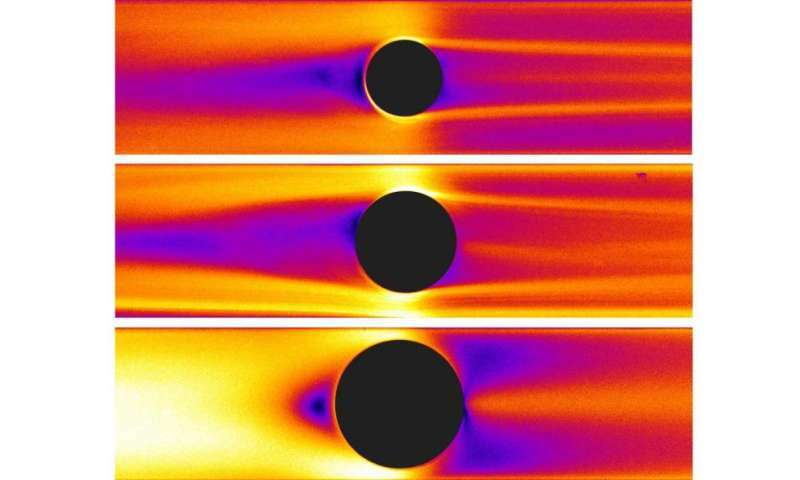 These experiments allowed the researchers to show that the mechanism for the onset of instability in this stretching flow is consistent with that for viscoelastic instabilities in other, more simple kinds of flows. In a curved pipe, for example, the onset of instability can be quite well predicted depending on the precise geometric conditions and fluid properties. However, until now it has never been shown that similar predictions can be applied to stretching flows. Many industrial processes, such as extrusion, fiber-spinning and inkjet printing, involve stretching flows of viscoelastic fluids. Flow instabilities generally have a detrimental effect on the quality of end products and so directly limit the rates at which such processes can be carried out. The ability to predict the onset of instabilities in such flows can aid in optimizing processing rates and obtaining superior end products. The results of the study are published in the open access Nature Publishing journal Scientific Reports. The Micro/Bio/Nanofluidics Unit also studies the flow of 'living polymers'. Like polymers, these materials form long chains of multiple repeating units, but unlike polymers, these units are not chemically bound together, but rely on other forces for cohesion. Wormlike micelles (WLM), a type of 'living polymer', form long, rod-like aggregates suspended in a solution. As with polymers, these materials have numerous industrial applications, including as additives in shampoos and cosmetics and as materials to enhance oil and gas recovery (EOR). WLM solutions are pumped into shale during fracking in order to extract more oil and gas from these underground rock formations. The solutions are initially thick and gel-like, which allows them to generate high pressures and fracture the shale. However, when they come into contact with the hydrocarbons, the micelles disassemble allowing the solution to behave more like water and easily flow out of the rock. These shale formations contain many obstructions that alter the flow of solutions within. Prof. Shen decided to use a simplified model to study the flow pattern of WLM solutions when a blockage is present. Dr. Ya Zhao, a former graduate student of Prof. Shen at the University of Washington, built a micro-scale channel in which she could observe the flow of WLM solutions around a cylinder acting as an obstruction in the flow path. She then compared the flow patterns of a Newtonian fluid and a WLM solution by observing the streaks formed by fluorescent tracer particles. She also measured the growth of stresses in the WLM solution using flow-induced birefringence. Determining how these materials flow is vitally important in optimizing their applications. These materials exist in a wide variety of products and are exploited in many industrial processes, making their optimization a priority for manufacturers. Determining their flow behavior is one step closer to achieving the full potential of these products.